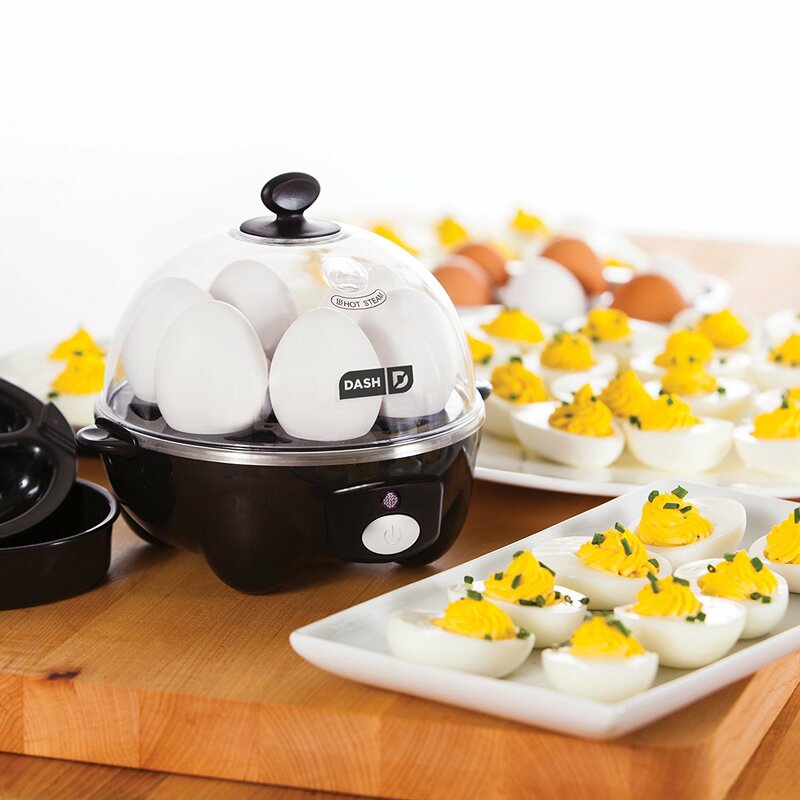 Dash Go Rapid Review: The Dash Go Rapid Egg Cooker is an easy to use unit. You can use the unit to cook up to 6 eggs at any time. On a functional level, this unit is capable of making soft, medium, hard boiled, poached eggs. And it can even stretch to making omelets. The appliance comes with a loud buzzer that alerts you when your eggs are ready. This unit comes in a variety of color options giving you the option of matching the appliance to your existing kitchen appliances. It’s available in black, red, white and aqua. The Dash Go is compact ensuring it takes up a minimal amount of counter-top and cupboard space. The Dash Go Rapid at the time of writing this review could be found for between $15.25 – $20.00. Since then the price may have changed and maybe lower. Click HERE to see the latest price. This unit requires no assembly, just take it out the box and it is ready to use. So you will be glad to hear that there is no need for a screwdriver or an Allen key. When you un-box the unit you should find the contents includes the base, a poaching tray, omelet tray, 6 egg holder tray, measuring cup, recipe book and recipe database access. So if your short on what too cook next using the Dash unit just refer to the recipe book. 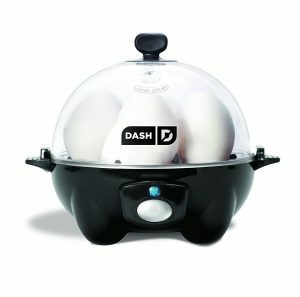 The Dash Go Rapid looks like your typical egg cooker. In terms of its external appearance it comes with a base that houses the heating plate, and a transparent lid. As mentioned earlier the base is available in a variety of colors; black, red, white and aqua. The lids are also distinguished by the Dash logo having the same color as the base. 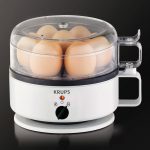 It’s main selling point is that the unit is capable of preparing perfect eggs quickly without the need for boiling water on the stove top. This will ensure you save time without having to deal with cleaning up extra pans. You can control unit using a one touch power button on the front of the base. 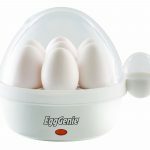 The lid is easy to remove allowing you to fill the base with water and load the eggs onto the tray. The unit is fairly lightweight weighing in at approximately 1 pound. It is easy enough to move around a kitchen and when ready for storage. Even though there is not a lot of weight to the unit it is well-constructed and does come with a 1-year manufacturer warranty. Dash Go Rapid – What’s it like to use? This unit works effortlessly. The cooking process is simple. Using the supplied measuring cup pour some water onto the heating element. Then place the eggs the onto the try, cover it with a lid, press the one touch button and 10-15 minutes later the buzzer will sound. To ensure the eggs are easier to peel remove the eggs from the unit as soon as the buzzer sounds and then place them in cold water immediately. 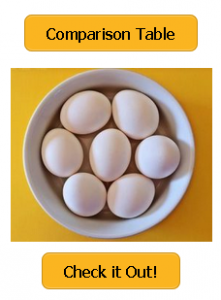 To control the doneness of the eggs you will need to adjust the amount of water you use. This is easily done using the supplied measuring cup. If you enjoy eating omelets then you might want to spray the omelet tray with some non-stick cooking spray. This small step will ensure the omelets are easy to remove. The buzzer is very loud, which will encourage you to shut the appliance off as soon and possible. To switch the appliance off you can push the once touch button after the buzzer has sounded off or you can switch the unit off at the power point. With the Dash Go Rapid cleanup is easy. If your feeling super lazy then you may not clean it every day. What you will notice is that if you don’t clean the heating plate on a regular basis that mineral deposits will quickly build up on the surface making the plate look rusted. Don’t worry this is not rust as mentioned it’s mineral deposits that are left behind after the water has evaporated during a cooking cycle. An easy way to remove the deposits is to use vinegar. Make sure the heating plate is dry and then pour some vinegar onto the surface. You will need to leave the vinegar on the surface from a couple of hours at the minimum to help remove the mineral deposits. You may need to repeat this step a few times to get the desired results. You will be surprised with how small and lightweight the unit is, making it easy to find space to store it in a kitchen cupboard. Yes quite possibly. 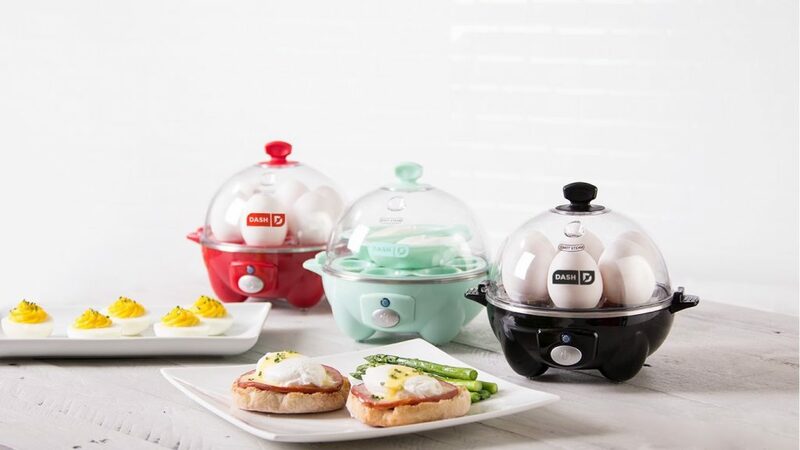 The Dash Go Rapid Egg Cooker is one of those kitchen appliances that you might think you don’t need, but once you have tried it you will wonder how you ever lived without it. 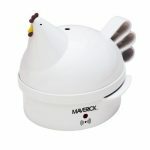 This unit doesn’t come with keep warm feature but it does prepare eggs perfectly. When looking at user reviews and opinions the Dash Go Rapid scores well. At the time of writing this review this unit has been reviewed by over 5500 customers on Amazon with a rating of 4.5 out of 5.0, Walmart customers score the unit 4.6 out of 5.0 from 158 customer reviews. The Dash Go Rapid scores highly with users, which is usually a great endorsement. With a capacity of 6 boiled eggs at once this unit would suit a family. And if your short on space then the compact size of the unit will be a definite plus. If you want a larger capacity unit then you might be interested in the popular Elite Cuisine Egg Cooker that is capable of cooking up to 7 boiled eggs during a single cooking cycle. 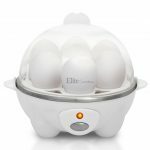 Find out more by reading our Elite Cuisine Egg Cooker Review.